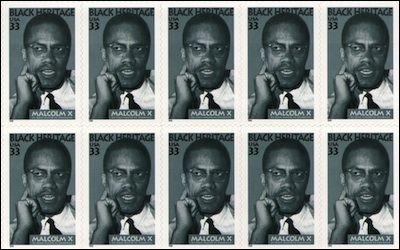 Originally published under the title, "Remembering Malcolm X Fifty Years Later"
A 1999 postage stamp in his honor symbolizes the establishment's acceptance of Malcolm X (1925-65). ​On this date fifty years ago, the man best known as Malcolm X was killed by a Nation of Islam (NoI) hit squad while speaking just north of Harlem, New York. Born Malcolm Little in Omaha on May 19, 1925, to a Baptist minister father and West Indian mother, both politically involved, he lived on the streets of various eastern U.S. cities until he was jailed in February 1946, where, a year later, he began his self-education program. He first learned about the NoI from his brother in about April 1948 and joined it later that year. Three weeks after his release from jail in 1952, he met Elijah Muhammad, the NoI leader, and commemorated his new identity by throwing off his "slave name" in favor of Malcolm X. From 1953 on, he devoted himself full time to building the Nation. In an eye-opening experience, he traveled to the Middle East in 1959, after which he began to adopt normative Islamic practices and become more critical of NoI, eventually changing his name to El-Hajj Malik El-Shabazz and then breaking with the NoI in March 1964, when he started a new movement, the Muslim Mosque, Inc. He went on the hajj to Mecca a month later, followed by other Middle Eastern and African travels. The Nation of Islam had Malcolm X murdered, apparently under the supervision of Louis Farrakhan. Outraged by what he perceived as Malcolm X's treachery, Elijah Muhammad had him murdered on February 21, 1965, apparently under the supervision of Louis Farrakhan. Were he still alive, Malcolm X would be approaching his 90th birthday. What to make of the Malcolm X legacy on this 50th anniversary? He was a quick study, a natural politician, and a powerful orator, as well as a highly original political figure, He played a major role both in the large-scale conversion of African-Americans to Islam in both its NoI and normative variants (his Autobiography continues to be cited as a major inspiration for becoming Muslim), and to the development of black nationalism, a milder form of his preferred solution that blacks withdraw from the United States and form their own country. 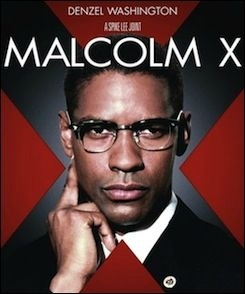 Mainstream perceptions of Malcolm X are informed as much by the 1992 Spike Lee movie as by the figure it was based on. His presence remains alive; and thanks to Spike Lee's movie about him, a U.S. postal stamp in his honor, and other signs of mainstream acceptance, he has become a somewhat anodyne figure. Here's how NBC News characterized him today, on the anniversary: "By the time he died, the Muslim leader had moderated his militant message of black separatism and pride but was still very much a passionate advocate of black unity, self-respect and self-reliance." But Malcolm X was anything but mainstream and the passage of a half century should not soften attitudes toward him. To the end, he remained a radical, polarizing, bigoted figure, Martin Luther King's evil Doppelgänger. To support this description, recall two notorious statements. The first dates from Dec. 1, 1963, shortly after the assassination of John F. Kennedy, when Malcolm X responded with the comment that, "Being an old farm boy myself, chickens coming home to roost never did make me sad; they've always made me glad." The second came in the course of a meeting with the Ku Klux Klan (itself a insight into his extremism) intended to win white racist support for the NoI black separatism project. According to a FBI report, Malcolm X assured the Klansmen that Jews were behind the integration movement they both despised. Joshua Muravchik concludes from this incident that Malcolm X "was a vociferous anti-Semite in both public and in private." Malcolm X should accurately be remembered as the extremist he was. Related Topics: African-American Muslims, Muslims in the United States | Daniel Pipes receive the latest by email: subscribe to the free mef mailing list This text may be reposted or forwarded so long as it is presented as an integral whole with complete and accurate information provided about its author, date, place of publication, and original URL.